cute shoulder detail (not shown) = +1 girly point. I've exceeded my girly quota on this project! So I think I might stick to using this colorway (Intensity) for Heatwave after all. 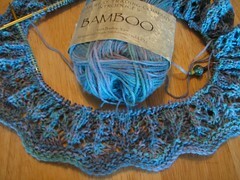 I've ordered some cobalt blue SWTC bamboo, and will start Lotus blossom again when it arrives. Too funny how I wish I had your Intensity colorway instead of my Cobalt Blue. That said, I think I like the Intensity colorway knitted up in the Heatwave pattern, IIRC your previous pic. This is too funny -- I, too, bought the Intensity colorway, and I'm starting to think it'll take an unusual amount of black eyeliner to balance out the fruh-fruh factor. I'm wishing I'd bought Purplexed instead. If this one fits, I may knit another one in purple or black. I am totally cracking up over your girly points exceeded comment. That color is beautiful. Good choice. I do like the Intensity colourway very much, and I like the way it zig-zags in stocking stitch. That's lost entirely in the lace stitch. So I will wait patiently for the cobalt blue to arrive, which I think is very nice also.